1. How much is my paycheck? This is probably more important to know than what you make in an annual salary because this is the “starting amount” that you have to live on. 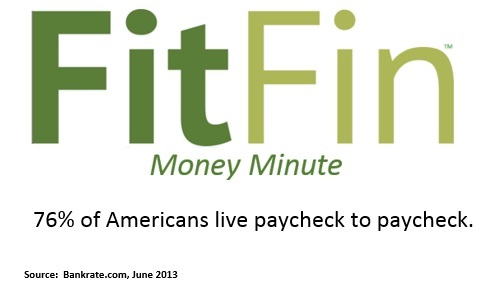 According to Bankrate.com, 76% of Americans live paycheck to paycheck. That number is rising every year, no doubt due to the availability of money distractions, like entertainment and going out to eat. If your income varies, you’ll want to collect a recent history of your paycheck amounts and come up with a best guess as to what that number should be. Be conservative with your number, so you don’t overestimate how much you make. Once you have this starting number, you’ll next look at your expenses. 2. What are my fixed expenses each month? This should be fairly easy to figure out by looking at your bank statement (either online or printed) and/or your online bill pay. Don’t forget to look at both monthly and irregular payments, like quarterly bills. Make sure to also include medical expenses, like prescriptions, co-pays, etc. Tally up this total fixed expense amount. Again, be conservative and give yourself a cushion for those oddly-timed payments or things you may have missed, despite your best efforts. You might also be taking money out of your paycheck and into a 401(k) or other savings vehicles. If you’re able to do this, great! If you’re not currently doing it, strongly consider if you can do so. It’s nice to “pay yourself” first. Look at the dollar amount that’s left over. This is the money you have to live on day-to-day. Next, you’ll want to look at your variable (daily) spending. Once you figure out the variable spending, your goal should be to have some money leftover that you can put into savings or something else that will improve your financial situation (i.e. life insurance, IRAs, etc.). 3. What are my variable expenses each month? This amount consists of expenses like groceries, going out to eat, going to the movies—the things you do every day. If you’re not sure about these numbers, give FitFin a shot. It will help you figure out this number and even has charts to help you see how these expenses change month-to-month. Now that I know what I spend each month, I’m trying to do is figure out how to decrease that amount without cramping my family’s style too much. It’s definitely a work in progress, but Step #1 is knowing what I’m spending. Using FitFin will not only help me know that (which is huge), but it also helps me know what I’m going to spend before I even go to the store. That helps me keep a handle on today’s spending. One day at a time, right? Check out FitFin (it’s free) at www.fitfin.com. FitFin can help you track your variable expenses quickly and easily. Here’s to a very prosperous 2015! Are “experiences” better than “things”? I recently saw a statement that said people are happier when spending money on experiences, as opposed to material things. When I read the statement, I was taken aback at first. I thought about all of the cool stuff I’d like to buy: a new Tesla Model S, a house with a view of Denver and the Front Range, a new laptop that was lightning-fast, and the list goes on. Then I thought about the word experiences, and what that meant. Skydiving? Scuba diving? Those things don’t really appeal to me. I was struggling with making this a true statement. Then I thought about it at a different angle: What if I only had six months to live and $100,000 to spend? Heck, might as well make it a million dollars if I’m being killed off, right? Surely, I wouldn’t run out and buy a car in this scenario! I’d take my family on trips; see the world! Of course, the practical part of me would probably put some money aside for a new house for the family, but we’d surely have some fun, too! Would I be able to take those experiences with me? Who knows, but I know that creating memories would be more of a legacy for my loved ones in twenty years than some rusted-out car. Then reality hit me that I don’t have a million dollars to spend, but what I realized is that experiences are better than material things, and many experiences are free! In fact, my kids and I went on an awesome hike this weekend just ten miles from our house. We spent an hour climbing rocks, navigating trails, seeing buffalo, having a blast! All for free! The kids loved it so much that I told them we’d start hiking “14ers” when they got old enough. For those non-Coloradans reading this, a 14er is a mountain whose peak is over 14,000 feet in elevation. Colorado has 53 of these, and many folks I know hike them virtually every weekend. I have never done this, but look forward to trying a few once the kids get old enough. Wherever you live, there are plenty of cool places near you to make great memories. And I would guess that many would cost you little more than the gas to get there. What could be better than a nice picnic lunch by a local lake, or a tour of that museum you’ve driven by 100 times but never stopped at? There are plenty of ways to make great memories with the people we love, and at least for me, reading that statement opened my eyes to the possibilities. Here’s to enjoying every little experience life has to offer! Black Friday blues? Start thinking about next year right now! According to the National Retail Federation, the average person spent $407.23 during Black Friday in 2013. Think about your situation in 2014: Did you spend more or less than the average? Grab your receipts if you’re not sure. Don’t be afraid. And if the thought of going through your receipts and adding up what you spent gives you anxiety, then please read on. Did your Black Friday purchases comprise of wants or needs? How many of the items were purchased solely because they were on sale? Would you have bought them otherwise? Were these purchases for you or gifts for others? If you bought gifts for multiple people, how much did you spend on each person? Is that amount in line with what you expected? Did you miss anyone on your list? Based on all of these things, when should you start saving for next year’s Black Friday? It’s not too early to put money away now for next year. In fact, if you look at your receipts and think that you might spend near that same amount next year, divide that amount by 52 (if you’re going to save weekly), or twelve if you’re going to save monthly. If you pay yourself that amount each week/month, you’ll have a good little kitty ready for Black Friday 2015. And if you use FitFin, it’ll be even easier because you can create a new budget in seconds (you might call it Black Friday–pretty original, I know). Then you can simply tweak one of your existing budgets (or a few of them if you want) by the amount that you want to save for Black Friday to keep your overall monthly budget consistent. To do this, just go to your Budgets Overview, click on the budget bar that you want to adjust, then hit the Edit button and change the amount. Again, this takes seconds. The reason you can do this is because you already know what you spend each month by using FitFin. Now you’re using the same concept by calculating your 2014 Black Friday spend and making educated predictions on if this year’s experience will reflect next year’s spending. Then once you have that knowledge, you can start saving now. By using this simple strategy, you can be assured that next year’s Black Friday won’t put you in the red. If you’re not using FitFin, you can sign up for free at www.fitfin.com. It’s a great way to get a handle on your day-to-day expenses! Do you know what you’re spending? Renee Portillo on Does Santa have a budget?